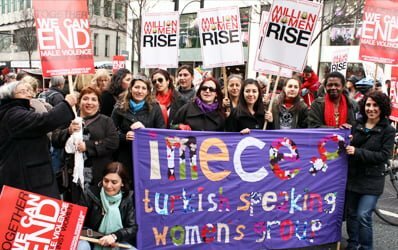 IMECE Women’s Centre stands against all forms of violence against women and girls. We support and empower Turkish, Kurdish and Cypriot Turkish women and Black, Asian, minority ethnic, refugee (BAMER) and migrant women to improve the quality of their lives. Established in 1982, IMECE Women’s Centre is a women-only space. We work with all those who self-identify as women. Our vision is a society where all BAMER women and girls are able to pursue their dreams and enjoy their lives free from all forms of violence, discrimination and prejudice. We are a specialist ‘by and for’ BAMER women’s organisation challenging women’s inequality. We deliver holistic services which support women to assert and enjoy their rights and achieve their aspirations. We work collaboratively with women themselves to design and deliver the services that meet their needs. IMECE Women’s Centre is a feminist organisation with human rights at our core. Our values reflect our history and were developed in consultation with staff, service users, volunteers and trustees.